I like the room set up and the quietness of the hotel. I do not like having to go down a long escalator to check in and to then get out of the hotel. Staff excellent, room clean and breakfast availability superb. 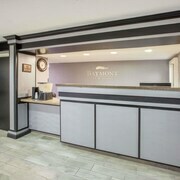 Where to find Canton hotels near an airport? Where can I find hotels in Canton that are near tourist attractions? Apartment and hotel options are plentiful in Canton. Approximately 20 places to stay can be found within a 0.1-kilometre (0.06-mile) radius from Canton's downtown area. 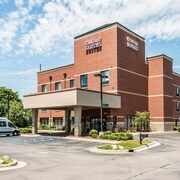 Some of the hotels that are not all that far from the heart of Canton are the Hampton Inn & Suites Detroit-Canton and Comfort Suites Canton. The Fellows Creek Lodge is nicely located 5 kilometres (3 miles) from the central area of Canton and is a sensible choice for those who like to save money wherever possible. 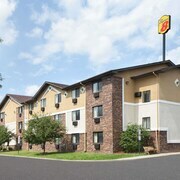 Visitors could also try the Super 8 Canton Livonia Area. The Bell Tower Hotel is 20 kilometres (13 miles) from the center of Canton. Another alternative is the The Westin Detroit Metropolitan Airport, which can be found 15 kilometres (10 miles) away. 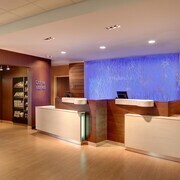 Alternative Expedia-listed hotels include the Hilton Garden Inn Ann Arbor and the Sheraton Ann Arbor Hotel. The greater Detroit - Southeast Michigan area is definitely worth exploring too. Check out Detroit - Southeast Michigan's history museums or enjoy the area's forests and lakes. In this region of United States of America tourists might partake in snowboarding. Looking for things to do? Why not spend a few hours enjoying Northville Downs and Twelve Oaks Mall, which you'll find in Novi - Livonia, 15 kilometres (9 miles) to the north of Canton. 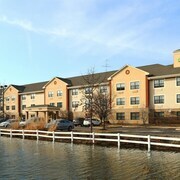 If you'd like to visit Novi - Livonia, check out the room rates at the The Inn at St. John's and Marriott Detroit Livonia. 45 kilometres (27 miles) to the northeast of Canton, is Troy - Auburn Hills, which is home to the Cobblestone Manor and Hilton Auburn Hills Suites. If you're staying in Troy - Auburn Hills, set aside some time to check out the Bloomfield Galleries and Callahan's Music Hall. Before you head home from Detroit, why not make sure you catch some local sport. Visit Comerica Park to the east of Canton. Book accommodation nearby to the action at the MGM Grand Detroit or the Detroit Marriott at the Renaissance Center. Situated 15 kilometres (9 miles) from Canton is Detroit Metropolitan Wayne County Airport. 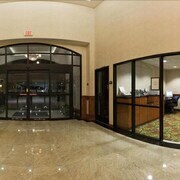 Stay nearby at Holiday Inn Detroit Metro Airport or SpringHill Suites by Marriott Detroit Metro Airport Romulus. What are the most popular Canton hotels? Cozy Canton Condo is Ready for You! Are there hotels in other cities near Canton? What other types of accommodations are available in Canton? Explore Canton with Expedia.ca’s Travel Guides to find the best flights, cars, holiday packages and more!